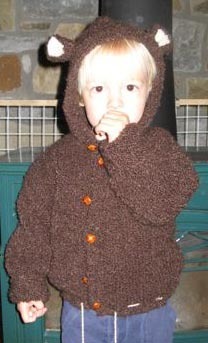 I used Teddy from Marks & Kattens for this cute sweater for our grandson. Teddy is a wool,courtelle, poly blend and machine washable. it knits at 3.5 stitches per inch. This pattern is one that I had wanted to do for a long time. When our daughter came to visit she had a catalogue from an excursive children’s shop and the sweater that she had picked out looked just like the Marks & Kattens pattern. That doesn’t happen often! This is the result. I have to brag on myself for this one. 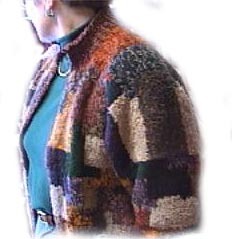 This is a Kaffe Fassett pattern that I knit for a friend. Her family commissioned it for her birthday. 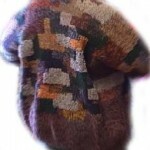 I used a wide variety of yarns and had great fun knitting it. 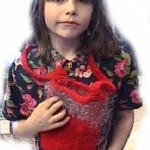 Here is a close up of Annika’s felted red bag. 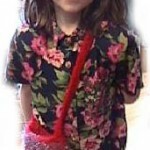 Here is Annika with her felted red purse. Knit with Baabajoes 10-ply wool and Trendsetters’s Aura. Annika at age 7 just finished this, her first felting project. Michelle Backes-Fogelberg wove this blanket for her new grandbaby using a number of Sirdar’s Snuggly yarns, Poppet, Dominos and Snuggly DK. I am very pleased that she is willing to share this picture because it shows how nicely these yarns weave up as well as knit. 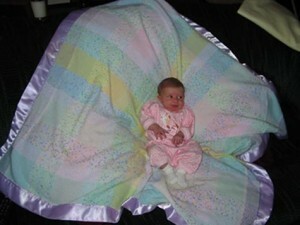 Michelle has given the baby not only wonderful colors to look at but different textures to feel. Lucky baby! Iris Scraw’s Baby blanket in Kool Kids and Snowflake. Iris used the one color of Kool Kids through out the whole blanket but changed the colors of the Snowflake to create the blocks. 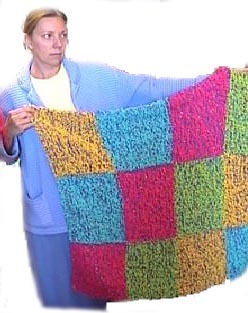 This blanket has great bright colors, some what lost in the picture, and wonderful texture. Iris is a prolific knitter and not afraid to chart her own course with needles and yarn.